The Stage - 19 April 1927. "Home Sweet Home" at the Theatre Royal, Barry. "Greta Wood, Olivia James, Eric Fane, Michael Rae and F.C Chabot give able support." 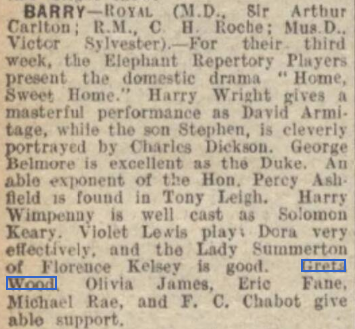 Greta Wood was in the cast of "Home Sweet Home", at the Theatre Royal, Barry, in 1927.